What Does Sod Quality Seed Mean? 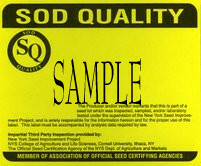 A sod tag indicates seed has passed rigorous purity testing procedures and is officially designated "Sod Quality". Sod quality standards vary from state to state, but it is accurate to say that all seed carrying the sod tag is tested to a much higher standard than the minimum requirement for certified seed. In Washington state, where most bluegrass seed is produced, the sod tag is bright yellow, often referred to as a "gold tag". In Oregon, where most of the tall fescue seed and some bluegrass is grown, the sod tag is light blue with a diagonal brown stripe. For example, in Washington, Oregon and Idaho, sod quality bluegrass requires examination of every seed in a 25 gram sample and sod quality tall fescue requires a 50 gram examination. In contrast, a purity test for Certified seed requires examination of a minimum of just 2,500 seeds, which is approximately 1 gram of bluegrass seed. Additionally, Sod Quality standards prohibit certain problematic weed and other crop contaminants that are otherwise allowable in seed labeled using a Certified seed test. The purpose of Sod Quality standards is to provide assurance to sod growers that the seed they plant will not contaminate their fields with difficult weeds and unwanted other crop species. The primary cool-season turfgrass species used by sod growers are Kentucky bluegrass and tall fescue, so they are the most commonly available Sod Quality seeds. Sod quality seed is not readily available to homeowners through retail outlets. It is not generally used in the landscape industry either, due to the fact it costs more than commercial grade seed and it exceeds normal quality requirements. At SeedSuperStore.com we purchase Sod Quality bluegrass and tall fescue seed whenever available. Look for the copy of sod tag on our price list for those varieties meeting the "gold standard" of seed quality.